Your monthly support is saving lives. Your gift of $19 a month will provide support, care, and services to disabled veterans, at no cost to them. Your generous gifts help our veterans know they are not alone. Thank you. FREE blanket! 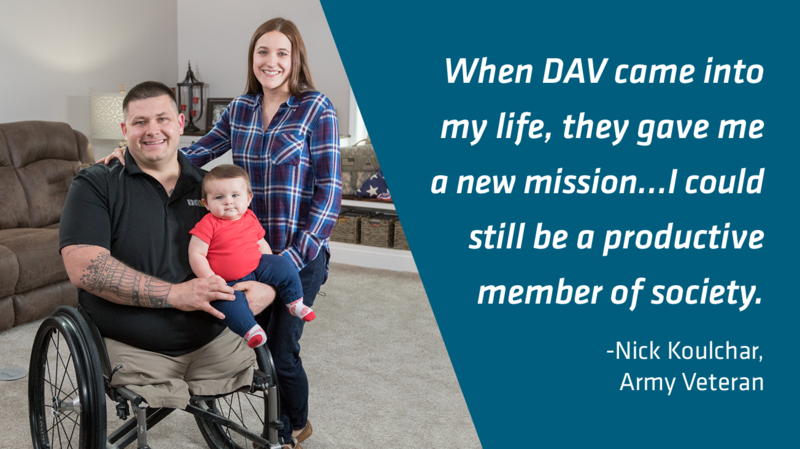 When you give $19 a month, you’ll receive our DAV blanket as a thank you. Your support is saving lives. Your tax-deductible gift will provide support, care, and services to disabled veterans, at no cost to them. Your generous gifts help our veterans know they are not alone. Thank you. FREE blanket! When you give a gift of $228, you’ll receive our DAV blanket as a thank you. Make my gift go further by not sending me a blanket. Please send me a blanket. Do not send me a blanket. By providing my number, I agree that DAV and its agents may contact me by phone call and text message. I want to make my gift go further by covering the credit card fees. Field Is Required Did you know DAV is charged a 3% transaction fee on your gift?